Norma Rae is a 1979 film which tells the story of a factory worker from a small town in the Southern United States who becomes involved in the labor union activities at the textile factory where she works. It stars Sally Field, Beau Bridges, Ron Leibman, Pat Hingle, Barbara Baxley, Gail Strickland and Noble Willingham. The movie was written by Harriet Frank Jr. and Irving Ravetch, and was directed by Martin Ritt. It is based on the true story of Crystal Lee Sutton which was told in a 1975 book Crystal Lee, a woman of inheritance by New York Times reporter Henry P Leifermann. 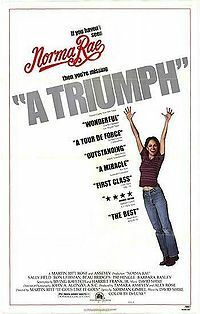 It won Academy Awards for Best Actress in a Leading Role (Sally Field) and Best Original Song (for David Shire and Norman Gimbel for "It Goes Like It Goes"). It was also nominated for Best Picture and for Best Writing, Screenplay Based on Material from Another Medium. The film was also nominated to the Palme d'Or (Golden Palm) at the 1979 Cannes Film Festival and Field was awarded Best Actress for her performance.